I have a special interest in Tom FIDLER, for he was the biological Great Great Grandfather of my late wife (Eldred), and the G-G-Great Grandfather of our sons. Peter FIDLER was only 26 years old when Tom was born, but he had already established a reputation as a very competent surveyor and explorer. Enthused over the new maps that he had provided HBC officials in London, Tom's father was ordered to continue his map-making. He was to be be sent on new expeditions, and for the next seven years he was engaged in trading while surveying in the northwest. On October 3 that year FIDLER began his journal with the heading: "A Journal from Long Point Cedar Lake to Swan River House, Summerset and Carlton Houses also the upper parts of the Red River in 1795 by Peter FIDLER". And so it was that from the time he was a three month old baby, Tom FIDLER would experience the rigors of travelling by canoe across the great northwest. This is how a litte voyageur travelled in those days. It is called a ticanagan. 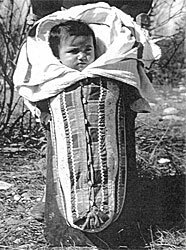 Strapped to mother's back, it acted as a 'car-seat' as well as a carriage. Moss was used as a diaper. The FIDLER family was at Cumberland House (SK) when Tom’s brother Charles (Charlie) was born on Oct 10, 1798; and at Chesterfield House (near present day Empress, AB) when his brother George was born Nov 10, 1800. Not long after George was born their parents (Peter and Mary) left to open up the Athabasca territory for the HBC, the three youngsters were left behind at York Factory. Tom was left with Thomas COLEN, who taught him his lessons and look after him. Charles and George (just infants) were left with their maternal Cree grandparents.Thomas COLEN (1781-1802), a “Writer”, was a nephew of Joseph COLEN (1751-1818), the Chief Factor at York. The fur-tradng posts that Peter FIDLER established (along with those built further north by William AULD) were intended to help bolster the HBC influence over north-western trade. The competition between the HBC and the North West Company (NWC) was fierce and often the two companies would build rival posts adjacent to one another which only intensified matters. When the NWC amalgamated with Sir Alexander McKENZIE’s XY Company, the Nor’Westers threatened that they would soon drive the HBC from the Athabasca region. “On Aug 6, 1805, for the fourth year in a row, FIDLER set out with his family for Fort Chipewyan (previously referred to as Nottingham House), with his usual complement of two canoes and eight men for the trip. This time, however, he knew that he faced certain failure. He knew that he would be lucky if he lived to come out in the spring. And yet such was his dogged loyalty, his sense of duty, and his quiet courage that he went.” (From the Peter Fidler book by McGregor, pg 159). He was harassed by the Nor’Westers every time they passed one of their posts. They arrived at Fort Chip on September 11. Tom was 10 years old that year, when the family had their first encounters with the notorious Samuel BLACK (c1780-1841), the hulking Nor’Wester who had been assigned to wear FIDLER down. BLACK pitched a tent not far from FIDLER’s house, and began a winter of harassment and bullying (shouting and hollering, pounding on Peter’s walls in the middle of the night, pulling up his garden and attempting to set fire to his house, even firing a shot close to his window). Peter would not be intimidated by these goons. Vastly outnumbered by his antagonists, he bravely stood his ground. Nevertheless, these must have been very traumatizing events for young Tom and his siblings. At the age of 13 Tom apparently made a trip to Stromness, in the Orkneys of Scotland. He was baptized there on Oct 12, 1808 by Reverend CLOUSTON. The ceremony was witnessed by John BALLENDEN and D GEDDES, "Esqures". The register states his father's name as Peter FIDLER, and his mother's name as "Methwewin". His father intended for Tom to be educated there, but for some reason that didn't happen. He returned to Canada. Obviously Tom wanted not part of going to school in this strange and intimidating white-man's world. It wouldn't be the last time that the rebellious youngster and his father would have disagreements. This information was derived from Heather Hallett's book "Children of the Rivers", page 74. ** See my note at the bottom of the page. Tom began to accompany his father on his many voyages, and was expected to share the work (including paddling canoes, portaging, hunting and fishing, etc). During the winter of 1809-10 the FIDLER family was at Ile a la Crosse, where they would face another winter of harassments even worse than those experienced at Fort Chip. Samuel BLACK was there again, this time accompanied by yet another notable antagonist, Peter Skene OGDEN. From the Peter Fidler book by McGregor: “BLACK & OGDEN conducted a systematic campaign of intimidation, the former swaggering about with guns and pistols, while OGDEN fondled his dagger. They shot at the Company’s weather-vane, fired at FIDLER’s flag, cut down his stockades, carried away his firewood, stole his fishing lines and cut his nets, so as to try to freeze and starve him out. Finally, they forbade his men to leave their house. With 26 men opposed to his eight, they terrified the Indians and denied them access to the HBC fort. The NWC’s technique was a more refined version of the mental torture they had practiced at Nottingham House. In its new perfection it operated more swiftly than on Lake Athabasca, and drove him out in a single season.” During these encounters, one of the Nor’westers fired a shot which narrowly missed Tom’s younger brother (Charlie). As soon as the family embarked from Ile a la Crosse, the Nor’Westers climbed over the stockades and set the place ablaze. In the fall of 1811 Peter FIDLER returned to Bolsover for a year’s furlough. Peter FIDLER left for England right around the time that the first advance party of Lord SELKIRK’s settlers were arriving at York Factory (Sep 24, 1811). Under the leadership of Governor Miles MacDONNELL, this party was sent to prepare the way for more settlers who would follow. This first group was forced to remain at York through the winter of 1811-12, and did not make the trip to Red River until the following summer, arriving at what is now St Boniface in August of 1812. Peter returned from England to York Factory in the fall of 1812. His assignment was to take over the charge of Brandon House from John R McKAY. He accompanied a 2nd party of settlers on their way to Red River, and then proceeded to Brandon House. However, he wasn’t able to spend much time there because he was frequently called upon to help the colonists get established. The building of Fort Daer at Pembina was one of these tasks, as well as surveying lots at Fort Douglas. During their father’s absences, Thomas (age 17) and his brother Charlie tried their best to run Brandon House, and in the spring of 1813 Tom was given the official HBC rank of “Writer”, and his brother Charlie began as a Labourer, both under their father’s supervision. Apparently the performance of these youngsters did not please McDONNELL, who didn’t think they should be trusted at Brandon House by themselves. During the winter of 1814-15 Tom’s father was able to spend more time with the family at Brandon House. He took pride in teaching his eldest sons (Tom & Charlie) the rudiments of surveying (star gazing, etc). Peter tried to get word to the settlement at The Forks. His son Charles was the only man available. Charlie and one other man no sooner embarked than they were surrounded by GRANT’s men, who took their guns and sent them back. They plundered FIDLER’s warehouse before proceeding on their way toward the mouth of the Pembina. On June 19, 1816 The Battle of Seven Oaks occurred with Governor SEMPLE and twenty of his men killed on Frog Plain. Cuthbert and the Metis then took Fort Douglas. Settlers who wanted to leave the Red River Settlement were offered protection by GRANT. Fort Douglas was recaptured on Jan 10, 1817 by Miles MacDONNELL and Captain D’ORSONNES, with troops recruited by Lord SELKIRK. Subsequently FIDLER built Halkett House near the Forks (which came to be known as “Fidler’s Fort”). John KIPLING (Tom’s future father-in-law) worked out of Halkett House as an interpreter around this time. His two year old daughter (Jane) would later become Tom’s second wife. Peace had been restored at Red River. The Metis began to disperse; Lord SELKIRK made a Treaty with Chief PEGUIS. Peter resumed his tasks of surveying lots and assisting with the ever increasing influx of settlers. On Sep 15, 1817 he returned to Brandon House to resume his old job as a fur trader. In the fall of 1817 Tom and Charles were sent to build an outpost on Lake Manitoba. In May of 1818 Tom’s 16 year old sister (Sarah) became the wife of William WILLIAMS (1800-1837), recently appointed Governor of the Southern Department of the HBC, a man old enough to be her father. In his journal for 1819 Peter FIDLER reported regarding his son, Thomas: Interpreter, (Lake) Manitoba; “Not fit for being an interpreter, disobedient, careless of the property and afraid of the Indians, but very hardy and ingenious”. Tom’s youngest brother (Peter Jr) was born Jul 2, 1820 at Norway House during a family trip to York Factory (Tom was left in charge at Fort Dauphin, during his father’s absence). On Boxing Day, 1820 Peter reported in his journal: "Tom went away to Partridge Crop (now Fairford, MB) - he having acted improperly here." Heather Hallett comments: There is no mention of what Thomas did to annoy his father. I suspect it may not have been much. Peter FIDLER Sr was a much beleaguered man, and by this time was in failing health. He seems, from what I have read, to have set very high standards of behaviour and achievement for his sons, and he may have been unable to temper censure with praise when it was earned. On March 26, 1821 an Amalgamation Agreement was signed in London which effectively meant the end of the existence of the North West Company and at long last an end to they years of bitter conflict. The Anglican presence in Western Canada was established when Rev John WEST (1778-1845), the son of a Wesleyan clergyman, was sent in 1820 by the Church Missionary Society (CMS) of England. On August 14, 1821 at Norway House he married Peter FIDLER & Mary MACKAGONNE. By the summer of 1821, Peter, greying and with deteriorating health, was demoted to Clerk at Fort Dauphin. Tom (age 26) was "country wed" to 25 yr old Nancy HALLETT around this time. Nancy’s first child, (James) was born on April 1, 1822 in St Andrews Parish. It’s unclear whether Tom was actually the father of James (no documentation). Peter FIDLER died at Fort Dauphin on December 17,1822 at the age of 53. Tom’s son John was born around 1825 and daughter Nancy was born Feb 12, 1826 in St Clements Parish. Tom’s mother, Mary, died on June 20, 1826, and in an 1827 administration of the Estate of Peter FIDLER was said to have been granted to Tom as his eldest son. Following that, the money in the hands of the HBC was divided equally amongst the eleven surviving children. The 1827 Red River Census recorded Tom FIDLER on Lot 118 (east of the Red). He was enumerated with 2 sons (James & John) and one daughter (Nancy). This area became known as Mapleton, just south of present day Selkirk (Sugar Point). Tom’s brother Charles lived next-door on Lot 117 with his wife Ann and two young children (Peter and Edward). On Nov 6, 1828, four of Henry HALLETT’s children were married on the same day at St John’s Anglican Church by Rev William COCHRANE (witnessed by James & Thomas SPENCE): 1) Nancy HALLETT & Tom FIDLER; 2) Ann HALLETT & Andrew FIDLER (Tom’s brother); 3) Henry HALLETT married Catherine PARENTAU); 4) Tom’s brother (Alban) married Nancy’s sister Margaret HALLETT & Alban FIDLER (Tom’s brother). In 1828 Tom’s sister (Sarah) was living with Nancy’s brother (James HALLETT) in St James, having long since been abandoned by her husband (William WILLIAMS)..
A daughter Mary was born in 1830, and it seems that Tom's wife, Nancy, must have died shortly after giving birth to their son Henry in 1831. In 1831 Rev William COCHRANE erected a wooden church at “the rapids” (Lockport), thus beginning the St Andrews Parish. This church was known as the “Lower Church”, after which time St Paul’s Parish church was called “Middle Church”. COCHRANE also established a school there. Heather Hallett hasn't found a record of Nancy (HALLETT)'s death, so this is an educated guess on her part. Heather speculated "she may have died while out on the prairie on a buffalo hunt". Tom had account # 38 in the Hudson's Bay Settler's Accounts in 1831. He owed 8 pounds, 8 shillings, 2 pence. Tom, 36 years old, was now a widower with 5 young motherless children, James 9, John 6, Nancy 3, Mary 2, and Henry, just a baby. The HBC began construction of Lower Fort Garry in 1832. By that time the HBC stabilized at about 1,000 employees and remained at that level for the next several decades. Buffalo hunts and the pemmican trade were still big around this time. Tom & Jane’s first child together was Mathilda "Hilda", born Mar 12, 1833. She was baptised on Mar 23 at the new St John’s Anglican Church built of logs. Son William was born May 18, 1835, and the Census for that year shows the family on Lot 93 (48 acres) in the Parish of St Clements. The first St Peters Church (North of Selkirk) was built of logs in 1836 a little south of the present one of stone (Rev William COCHRANE in charge). Tom’s family grew with the birth of Maria in 1836; Jane on Nov 13, 1837; Elizabeth on Mar 4, 1840, and finally Thomas Jr on July 30, 1843. Henry HALLETT (Nancy’s father) died Mar 5, 1844. He was buried in St John's Anglican Cathedral Churchyard in Winnipeg. He was about 72 yrs old. In 1847 Sir John FRANKLIN disappeared into the Arctic with 2 ships and 128 men trying to find the North-West Passage. Dr John RAE went to England where he and Sir John RICHARDSON were appointed by the British Admiralty to try to learn the fate of FRANKLIN. Five of Tom’s children were baptised on the same day (Feb 27, 1849) at the newly completed St Andrews Stone Church (William, James, John, Nancy and Maria), and on March 15 that year son James married there to Elizabeth LINKLATER. Elizabeth may have been a daughter of Elizabeth SANDERSON & John LINKLATER (born c1799). During his 1850-51 expedition Dr RAE searched the western, southern and eastern shores of Victoria and Wollaston islands, charted some 630 miles of unknown territory, and found pieces of wood that were probably parts of Sir John Franklin's vessels. John FIDLER (Tom’s son) was hired to accompany RAE on this trip as a steersman. Tom must have been beaming with pride and recalling the days of his own youthful adventures in the far north with his father. Tom was 55 years old now. On Dec 30, 1852, daughter Nancy married in St Andrews to Thomas William GARDINER (1828-1863) from Scotland, an HBC employee at Lower Fort Garry. In 1853 RAE again sailed to Repulse Bay (another Franklin expedition covering some 1,100 miles). This trip enabled RAE to return to London with the first solid evidence, from Inuit sources, of the fate of Franklin and his crew. This same voyage also enabled RAE to find the last unknown link in the much-sought-after North West Passage. This time Tom’s son Henry was with RAE (as a middleman and labourer). He accompanied RAE as far as Chesterfield Inlet and when arrangements had to be made to winter at Repulse Bay, he was one of the men sent back to York Factory. Upon his return to England Dr RAE was awarded 10, 000 pounds for his findings. Henry FIDLER’s share of this reward amounted to 30 pounds. In 1854 daughter Mary & Philip BIRD departed for Oregon with the James SINCLAIR party of settlers from Red River. They would never return. In 1855 Governor George SIMPSON of the HBC sent Chief Factor James ANDERSON (1812-1867) and James Green STEWART (1825-1881) to investigate the Inuit reports that RAE had used on his expeditions. ANDERSON & STEWART traversed north along the Back (Great Fish) River and found further evidence of Franklin’s fate. Both John (as steersman) & Henry FIDLER (a middleman) went on this trip, as well as their cousin, Edward KIPLING (son of Jane’s brother, George KIPLING); and also Paulet PAPANEKIS & Thomas MUSTAGAN from Norway House. Around 1857 son in law William SINCLAIR died, and his widow (Tom’s daughter Mathilda) re-married Sep 27, 1859 at St Andrews Church to Donald McLEOD, son of Elizabeth SWAIN & John McLEOD (1793-1873). Sam TAYLOR (1812-1894) was the Chief Builder of the St Clements Anglican Church (at Mapleton).In his diary, he noted in some detail the building of the church. “On Aug 7, 1861, the first human being buried at Mapleton Church was a little boy of George KIPLING who was born on Sunday the 22nd Sept and was buried on the 24th”, and "On December 1861, Sunday 1st, the Church of St Clements was opened for divine worship by Lord Bishop of Rupertsland and Mr HUNTER. The church was full of people from up above and down below. Indeed, many had to go home as it was rather cold that evening". In 1862 TAYLOR notes the hanging of the "John West Bell" in the St Clements church. Everyone who has lived in Mapleton to this day is familiar with the sound of this old bell. In 1866 Tom’s son William was married there to Jane YOUNG. In 1867 the Dominion of Canada came into existence and negotiations began to acquire Rupert’s Land from the HBC. Louis RIEL seized Upper Ft Garry at the junction of the Red and Assiniboine on Nov 2, 1869. On March 4, 1870 Thomas SCOTT was executed. On July 15, 1870 Manitoba became the fifth province of Canada, directly as a result of RIEL's leadership. On Aug 23, 1870 RIEL fled for his life to the USA, fearing that an anticipated amnesty would not be obeyed by the 1200 soldiers coming to the province. More than a 1000 people lived between Sugar Point and the Netley Marsh around 1871-72, mostly half-breeds and Indians. Less than 50 were whites. Dominion Land Surveyors came through the Parish in the winter of 1872. Winnipeg was incorporated as a City in 1873 (population about 2,000). Selkirk's population was about 400. 150 Red River carts departed Fort Garry for Fort Edmonton. Three contingents of the newly formed North-West Mounted Police were stationed at Lower Ft Garry (1873-74). Tom FIDLER died at the age of 80 on March 1, 1875. He was buried in St Clements Anglican Churchyard at Mapleton on March 3, 1875. In Census 1881 Jane (age 75) was enumerated with her daughter Elizabeth LEBLANC’s family. Jane died in St Clements in 1884, buried in the St Clements Cemetery. ** Note: There has been conjecture about Heather Hallett's statements about Peter FIDLER going to England in 1808 and about Tom’s baptism there that year. Such a record can indeed be found online. Here's the link: Fiddler: Births & Baptisms, Orkney. Thomas FIDLAR, christened Oct 12, 1808 in Stromness, Orkney, Scotland. Father: Peter FIDLAR. Mother: Methwinan FIDLAR. The spellings are incorrect but the info matches have definite credibility. And how many women in Scotland had an obviously Indian name like Methwinan? The baptism was witnessed by John BALLENDEN and D GEDDES, "Esquires". These would be John BALLENDEN (1758-1817) who was the Chief Factor at York Factory from 1800 until he retired to Stromness in 1802. D GEDDES would be HBC Stromness Recruiting Agent David GEDDES (1751-1812), appointed to that position in 1791.